British naval policy in the First World War era has become a topic of considerable debate in the last two decades. One of the key issues with which historians have grappled has been the question of the relative importance assigned to home and imperial defence by contemporary politicians and defence planners. Taking their lead from Colonial Secretary Joseph Chamberlain, who in 1902 labelled Britain as a ‘weary titan’ labouring under the burden of ‘imperial overstretch’, some scholars have maintained that the defence requirements of the Empire had placed an unsustainable burden upon British state finances. 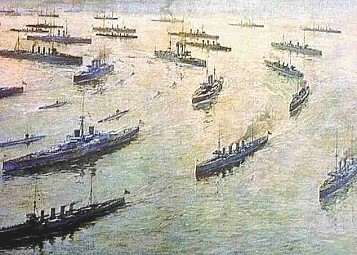 In recent years this interpretation has been challenged by other writers, who have pointed out that, far from dispersing Britain’s own resources across the globe, by the outbreak of the First World War in 1914, the British government was in fact drawing military and naval resources from the Empire into the European theatre. Nowhere was this more evident than in the case of the Royal Navy, which dramatically reduced its presence in the Pacific and Mediterranean after 1900 in favour of concentrating in home waters. Indeed, during the First World War, modern capital ships financed by Australia, New Zealand and the Federated States of Malay all served with the British Grand Fleet in the North Sea. Despite moving away from the notion of ‘imperial overstretch’, historians remain divided as to the true reasoning behind the redistribution of British naval force which occurred after 1900. Taking their lead from diplomatic historians, who emphasize Britain’s troubled relations with Russia before 1906-7, some writers claim that the threat of a Franco-Russian combination continued to trouble Britain’s naval leadership until at least the middle of the decade. 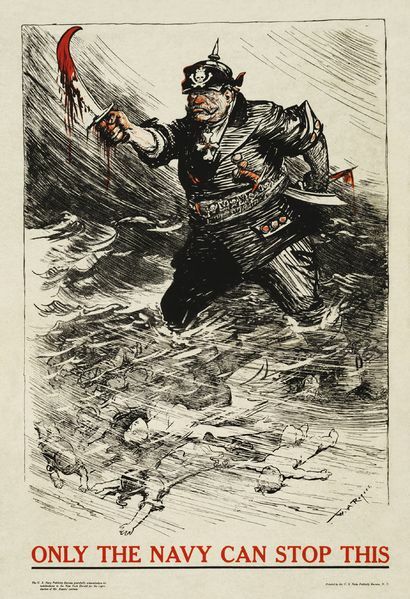 Others, pointing to the considerable body of evidence regarding contemporary concern at developments in Germany, maintain that the ambitions of the Wilhelmine Empire motivated Britain’s strategic realignment. However, until recently historians have under-rated a vital element in the Admiralty’s strategic decision-making process in the first decade of the twentieth century: the risk of a German invasion of the British Isles. On first inspection, the notion that the threat of a military invasion played a key role in dictating the concentration of naval forces in home waters seems questionable. After all, in the 1880s and 1890s, a period during which tensions between Britain and France – a major military and naval power only some twenty miles distant – often ran high, the Admiralty saw little difficulty in maintaining a significant worldwide presence. Nevertheless, a careful re-examination of the surviving documentary evidence reveals that Admiralty planners assigned significantly more importance to the question of a German invasion that has hitherto been appreciated. Very probably a raid* on the East Coast, or North of Great Britain. with the BRITISH Fleet to the Southward and not mobilised, if news of the Transports having started is received within about 12 Hours of their departure, the GERMANS have a very fair chance of landing an Army of 80,000 men with a proportion of guns and vehicles at any place on the East Coast from YARMOUTH to NEWCASTLE – and that, with the HOME Fleet mobilised, but at CROMARTY, they have an equal chance at any point from HULL to the Southward. These assessments demonstrate how Britain’s naval leadership took the threat of a German invasion of the British Isles extremely seriously before the First World War. Due to geographical and practical reasons – the German Fleet was always concentrated in the North Sea and the Germans had access to a far more numerous merchant marine to act as transports – Germany presented a genuine threat of invasion in a manner France had not before 1900. As such, meeting the threat of a German military descent on the east coast became a key objective of British naval planners both before and during the First World War. The implications this has for our understanding of British naval policy and the formation of national strategy in the so-called ‘Fisher era’ are explored more fully in my new article, “History is a Record of Exploded Ideas’: Sir John Fisher and Home Defence, 1904-1910’, recently published in The International History Review, and in my upcoming monograph, tentatively entitled, ‘The Invasion Question: The Defence of the British Isles, 1888-1918’, which is currently in the final stages of production. For example see C. Barnett, The Collapse of British Power (London, 1972); B. Porter, The Lion’s Share: A Short History of British Imperialism 1850-1970 (London, 1975); K. Robbins, The Eclipse of a Great Power: Modern Britain 1870-1975 (London, 1983); P.M. Kennedy, The Rise and Fall of the Great Powers: Economic Change and Military Conflict from 1500 to 2000 (London, 1988); and A.L. Friedberg, The Weary Titan: Britain and the Experience of Relative Decline, 1895-1905 (Princeton, 1988). G. Martel, ‘The Meaning of Power: Rethinking the Decline and Fall of Great Britain’, The International History Review, Vol. 13, No. 4, (Nov. 1991), 662-694; and K. Neilson, “Greatly Exaggerated’: The Myth of the Decline of Great Britain before 1914’, The International History Review, Vol. 13, No. 4 (Nov. 1991), 695-725. P.P. O’Brien, ‘The Titan Refreshed: Imperial Overstretch and the British Navy before the First World War’, Past & Present, No. 172 (Aug., 2001), 146-69. For example see J.T. Sumida, In Defence of Naval Supremacy: Finance, Technology and British Naval Policy, 1889-1914 (London, 1989); ‘British Preparations for Global Naval War, 1904-1914: Directed Revolution of Critical Problem Solving?’ in M. Toft and T. Imlay eds., The Fog of Peace and War Planning: Military and Strategic Planning under Uncertainty (London, 2006); N.A. Lambert, ‘Admiral Sir John Fisher and the Concept of Flotilla Defence, 1904-1909’, The Journal of Military History, Vol. 59, No. 4 (1995), 636-660; Sir John Fisher’s Naval Revolution (Columbia, SC, 1999); and ‘Transformation and Technology in the Fisher Era: the Impact of the Communications Revolution’, Journal of Strategic Studies, Vol. 27, No. 2 (2004), pp. 272-97. For example see M.S. Seligmann, ‘Switching Horses: The Admiralty’s Recognition of the Threat from Germany, 1900-1905’, The International History Review, Vol. 30, No. 2 (2008), 239-58; The Royal Navy and the German Threat, 1901-1914, Admiralty Plans to Protect British Trade in a War Against Germany, (Oxford, 2012); ‘Britain’s Great Security Mirage: The Royal Navy and the Franco-Russian Naval Threat, 1898-1906’, Journal of Strategic Studies, Vol. 35, No. 6, (2012), 861-886; S.T. Grimes, Strategy and War Planning in the British Navy, 1887-1918 (Woodbridge, 2012); and C.M. Bell, Churchill and Sea Power (Oxford, 2013). * Raid was a contemporary term understood to mean a landing of between 5-10,000 men.